We’ve kicked our winter colds, cleared our calendars, plowed our driveways, and thawed our gear in anticipation for the second official North Star bout of Un/Lucky Season 13. What else could possibly go wrong? 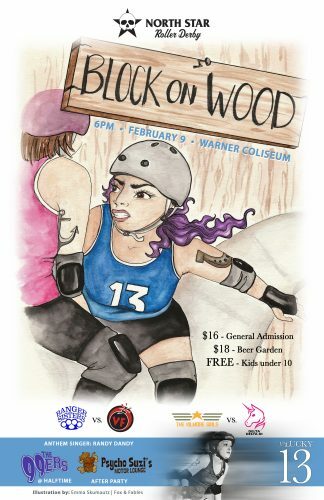 Watch us block shoulder to shoulder and hip to hip Saturday, Feb. 9 at “Block on Wood” at the Lee & Rose Warner Coliseum on the State Fairgrounds. Doors open at 5 p.m. and the bruises begin at 6 p.m. First to play are the Banger Sisters and the Violent Femmes. Then, watch Delta Delta Di take on the Kilmore Girls. Halftime entertainment between bouts will be provided by pop punk and rock and roll band The 99ers. But wait! Don’t just head straight home for your jammies, the action keeps rollin’ at Psycho Suzi’s Motor Lounge for the tiki-tastic afterparty. Tickets are on sale now on Brown Paper Tickets.